Looks good! I’ve always loved chicken-n-dumplings so I’ll have to try it out in the crock pot. For some reason, my crock pot scares me! Hah. 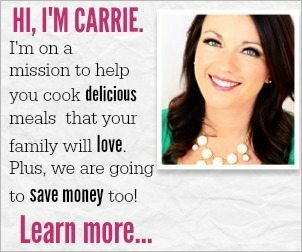 You will love your crock pot once you learn how to use it. 🙂 Try this recipe and let us know what you think. I can’t wait to make this. I was wondering, can I make my own biscuits? Do you put the chicken breasts in whole or cube them first? Hi, can u tell me what the consistency is of the buscuits when they are cut up? I’m asking bc my mom always made fluffy biscuit type dumpling growing up and il not a fan of the pasta like dough dumplings. I want to make sure before I make this bc it looks quite delicious! Making this now! Can’t wait to try it. Except I used chicken broth instead of water because I dont have poultry seasoning. I put them in whole. I would probably add another cup to a cup and a half. Well, I am making this for dinner tonight. I did double the recipe since I have a big family. I had do to the high cook setting since I got to the store late. Crossing my fingers it turns out well. I added carrots, onion and celery. I’ll let you know how it goes. Yes, it is including the 1-2 hours for the dumplings. Let me know how you love it! I wanted to make this for dinner tonight but i forgot to get the biscuits! Do you think canned crescent rolls would work as a substitute? I think that would be amazing! It might look different, but I think it would taste great! Are there options to make this in the oven? You know… I’m not sure. I will have to try it a few times and do another post and let you know how it turns out. This was amazing! I used three chicken breast because mine were on the smaller side. Also added one more cup of water and four chicken bouillon cubes. I’ve already passed this recipe on to two people and we just finished dinner! I’m sure they will be visiting your site as often as I will! Made this for dinner tonight. Delicious! Will absolutely add this to recipes to keep. Thanks so much! I’m so glad you liked it. My house smells delicious, can’t wait to taste this meal! Quick & easy. Thanks for sharing this recipe with us! Just made this! Loveee it! Thanks so much for making it easy on us working busy bee moms!!! Instead of water you could use broth. It only cost $1.29 at aldi. I’m gonna make 2 crocks of this for my husbands birthday. It’s been super cold here in north east Ohio so this will make a great dinner to feed my inlaws! I did a bag of 7 boneless skinless chicken breast would i need to triple the ingredients?? Have you ever tried putting the chicken in frozen? I forgot to thaw it last night! And now will only have until noon before putting it in the crockpot, so I am sure it won’t be completely thawed. Any suggestions? Can you use chicken broth in place of water? This sounds amazing! Could I use chicken broth in place of the water? I would love to make this for dinner tonight and thought maybe the broth would give it a little more taste. Has anyone tried this with homemade biscuits? Do you think the cooking time would be different with homemade biscuits? I don’t think it would take much longer. I haven’t tried it yet, but I would definitely give yourself time in case they take a bit longer. Yes you can definitely do that – We have done that several times. Yes, I have placed the chicken in frozen. You will just need to good it a bit longer. Oh man – I also add salt before seasoning. Bake the biscuits first or put them in unbaked? Put them in unbaked. They will cook in the crock pot. Any idea the nutritional value for the meal? I’m not sure but you can easily put in the ingredients in at many websites and it will give it to you. So although this blog post is a year old I just had to write and say I made this tonight! Everyone try this, it’s amazing!! So So Good!!! What can I replace the cream of chicken soup with? I can’t eat dairy..